Unconditional acceptance, companionship, and comfort are just some of the rewards we get when we bring a new dog into our lives. Canines perform the role of friend and protector so well, that we even refer to them as ‘man’s best friend.’ If a dog is highly trainable and has the right temperament, then they might be suitable for work as a service dog or for therapy dog work. By definition, a service dog performs a particular task or tasks that help to mitigate a disability for their human. They work with one individual and are highly trained to perform their specific job. Therapy dogs, provide emotional comfort and are trained for social interaction, but not individual tasks. The American Kennel Club (AKC) explains the difference between the two. Alerting diabetics when their blood sugar is high or low. Sensing the onset of seizures. Providing stability to people with mobility issues. Visiting hospitals to bring joy to patients. Providing comfort to those suffering from depression. A therapy dog should show themselves to others as friendly, not easily excited, and enjoy handling. The first step is always Basic Obedience. 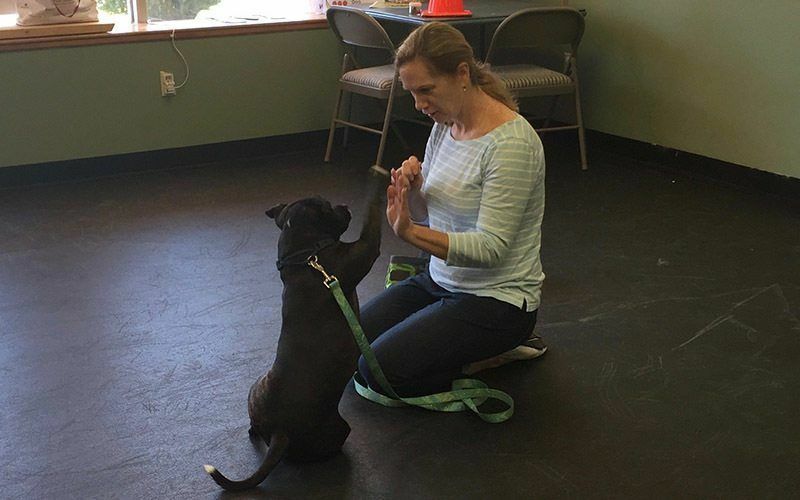 Whether you are training a puppy or an older dog, Basic Obedience Training gives you an opportunity to evaluate your dog for future therapy work. If you and your trainer feel that your animal might make a good therapy dog, then the next step is Canine Good Citizen training. The American Kennel Club started the Canine Good Citizen training program in 1989. The CGC certification program rewards dogs who have good manners at home and in the community. All dogs who pass the 10-step CGC test will receive an official certificate from the American Kennel Club. Once your dog earns his CGC certificate, then he can receive further training on the specific requirements for the Therapy Dog Test. 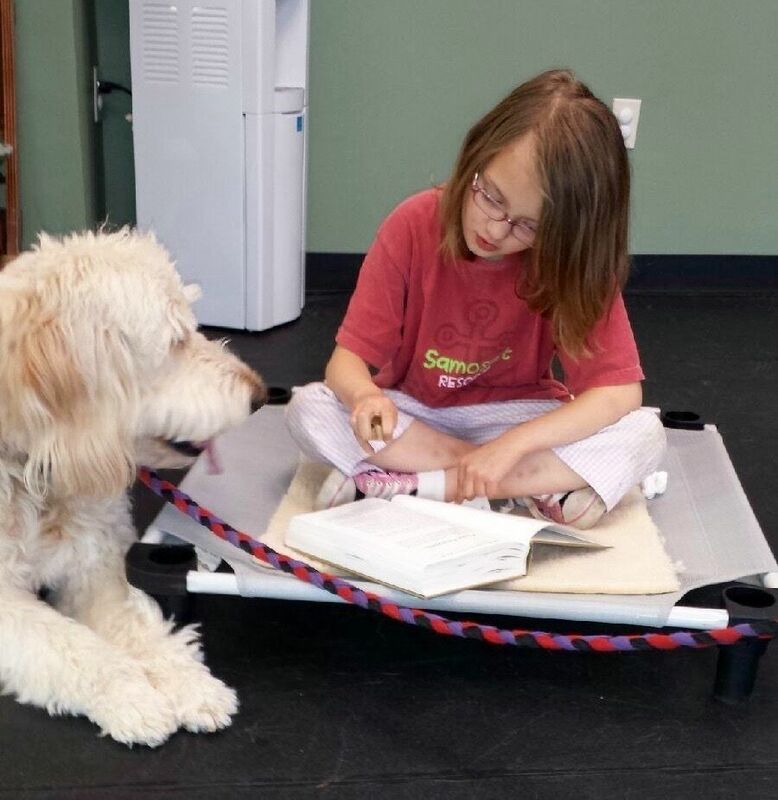 Normally, owners handle their dogs, but sometimes when a therapy dog takes part in Animal Assisted Therapy, a professional therapist works with your therapy dog. Helping Paws is a pet therapy group run by White Mountain College for Pets. Any certified alumni of our Therapy Dog program is eligible to join. We arrange visits with local facilities and provide continuing training opportunities to our members. College for Pets dedicates themselves to your success. We specialize in effective pet training with lasting results. Our goal is to help you, and your pet has the best relationship possible. Contact us if you are interested in joining Helping Paws or if you want more information on how to train your therapy dog. We offer classes on-site or online.